Racheal Nordby of Oregon State University certainly was busy during 2018 IHSA Nationals. 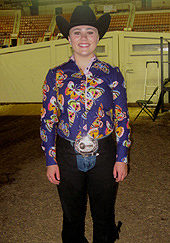 After placing eighth in team open reining on May 4th Nordby (pictured) finished second in individual open western horsemanship later that day. Two days later Nordby was fourth in the individual AQHA high point open rider class and concluded her junior year with the Beavers by again placing second in team open western horsemanship. Nordby is no stranger to IHSA Nationals, having competed in more than one class at each of the past three Nationals competitions. From Bend, Oregon, Nordby won the team open western horsemanship class as a Freshman in 2016 and has made the top ten in the individual AQHA each of her first three seasons with Oregon State. 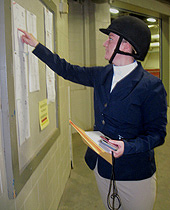 From Vancouver, British Columbia, Natalie Nahirney of the University of British Columbia (pictured) earned her best ribbon at an IHSA Nationals event in her final undergraduate IHSA appearance. 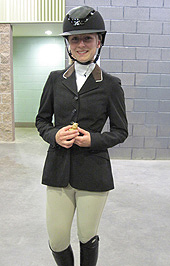 Nahirney was fourth in individual open equitation on the flat at IHSA Nationals in Harrisburg, Pennsylvania on May 3rd. Nahirney had won the division nearly a month earlier at Zone 8 Zones in Stanford, California on April 7th. Nahirney was also a Cacchione rider for UBC at 2016 Nationals. The first class of the day on the third of four days inside the Pennsylvania Farm Show Complex in Harrisburg was the first of two hunter seat Alumni classes, the Alumni over fences. Autumn Palmer of the University of Oregon is seen here studying the course. Palmer was the only alumni rider from Region 4 to compete beyond Regionals, earning a second in Alumni fences at Zones on April 7th. Palmer is one of a small number of riders who was still in school yet showing in the alumni divisions last season, this owing to having used up all eight semesters of undergraduate eligibilty through the spring of 2017. In the 2018 IHSA Nationals program she is listed as Katherine Talbot but at Zone 8 Zones she was simply Kate Talbot. 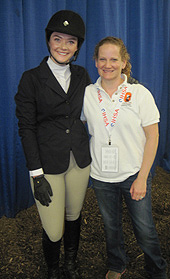 Seen here with head coach Dawn Ross at IHSA Nationals, Talbot was second at Zones for Oregon State in the individual novice over fences division. From Lake Oswego, Oregon, Talbot was one of only two Oregon State riders to compete at Zones (Tori Butterworth in individual walk-trot-canter was the other) and the only member of the Beavers' hunter seat team to advance all the way to Harrisburg. 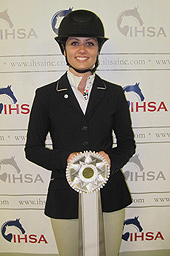 Claire Anderson of the University of British Columbia rode at IHSA Nationals in 2016, 2017 and 2018. This photo actually dates from 2017 Nationals in Lexington, Kentucky, when Anderson was waiting to draw a horse in individual intermediate over fences (she would place seventh). Anderson finished her senior year by earning a spot in the Cacchione Cup Competition, having won the Cacchione Class at Zone 8 Zones at the Stanford Red Barn on April 7th (yes I know in Canada they call a 'senior' year simply the fourth year, but Anderson is actually from Mill Valley, California so we can get away with the senior verbage this one time). Anderson also won individual open over fences at 2018 Zone 8 Zones. Oregon State University had but three points through three team classes in their search to be the top western team at 2018 IHSA Nationals. The Beavers were much better over the final three team classes, earning two seconds and a third. 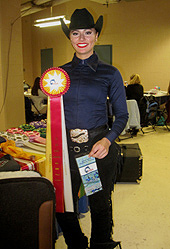 Nordby was second in team open western horsemanship while Monica Steenkolk (pictured) was second in team intermediate western horsemanship. From Toledo, Oregon, Steenkolk is seen here in the trophy room at the Pennsylvania Farm Show Complex after her red ribbon effort. Oregon State went on to tie Middle Tennessee State University for third place, with both schools scoring 17 points to trail only Ohio State with 19 and Champion University of Findlay with 28. Schools competing in Zone 8, Region 4 during the 2018-2019 school year: Central Washington University, Linn - Benton Community College, Oregon State University, University of British Columbia, University of Oregon, University of Washington, Washington State University, Western Washington University and Willamette University.